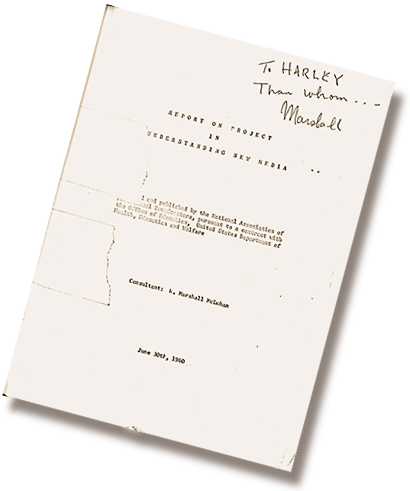 Students and scholars of Marshall McLuhan will be happy to learn that the modest looking typescript document depicted above can now be downloaded as a PDF, thanks to Professor Norm Friesen, presently teaching at UBC. According to Terrence Gordon, McLuhan’s second biographer, McLuhan referred to the project as “Vat 69”, the name of a popular brand of blended Scotch whisky of the time; in effect the project was a “cauldron where he tossed in as many ideas as he could seize, hoping eventually to turn his study into a book”. That book of course, published four years later, was Understanding Media: The Extensions of Man (1964). 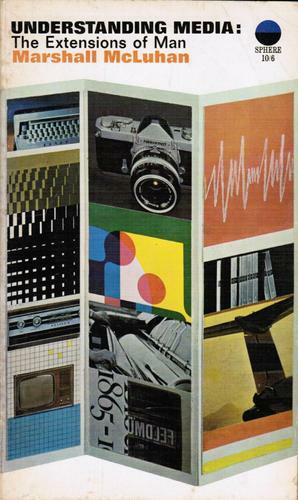 NAEB had contracted McLuhan to design a method and syllabus for teaching high school students about the nature and effects of media, old media, as well as new media. McLuhan was using the phrase “new media” decades before its latest incarnation as a term for digital media and the Internet. McLuhan explained that secondary schools were chosen because their students had not yet acquired any vested interest in acquired knowledge, had great experience of media, but no habits of observation or critical awareness, “yet they are the best teachers of media to teachers, who are otherwise unreachable” (1960, p. 4). The last comment is especially pertinent today. This appears to have been the very first media literacy curriculum ever written, predating later work in Britain and Australia in the late 1960s and ‘70s. Gordon, T.G., Ed. (1994). The critical edition of ‘Understanding Media: The Extensions of Man’. Corte Madera, CA: Gingko Press. McLuhan, H.M. (1960, June 30). Report on project in understanding new media. Washington, DC: National Association of Educational Broadcasters. Moody, K. (2002). Marshall McLuhan: The revolution is – media! Center for Media Literacy. Retrieved from http://www.medialit.org/reading- room/marshall-mcluhan-revolution-media . In the cryptic note at the top right (on p. 2), McLuhan writes to Harley Parker, with whom he later co-authored Through the Vanishing Point: Space in Poetry and Painting (1968) and Counterblast (1969). Parker also appears with McLuhan in the 28 min 1969 filmPicnic in Space, directed by Bruce Bacon. The full text of this report is available for downloading at http://tinyurl.com/om7eky2.